To Mozart aka Amadeus -) : Thanks for reminding me to remember who I'm and never apologize for it. First of let me start by saying, I'm a Kikuyu, I 'm not ashamed of it, I do not condone tribalism and I respect other Kenyan tribes. While chatting with a pal of mine the other day, he asked a question as to why Kikuyu are often seen as tribalistic because of trying to keep alive their culture and traditions. By speaking their language(although sometimes they can be insensitive when a non Kikuyu speaker is around), keeping up with their customs and holding dear what is Kikuyu. I didn't have a good answer to that question but for a person who has been studying the Kikuyu culture and Kenya in general, I bet he had some answers of his own. My pal challenged me on how much of a kikuyu I'm and I was ashamed to admit not a good one. 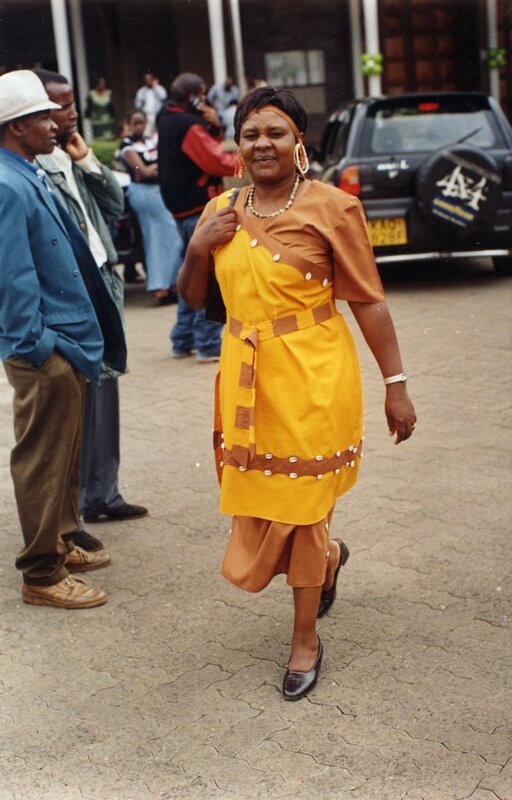 I have tend to forget the customs and values that are what made Kikuyu's who they are. Honestly I think Kikuyu have been misunderstood and the following is a synopis courtesy of www.bluegecko.org. It is when reading this that I realized most what Kikuyu are was ingrained many many years ago and has in most part not related to the accusations and stereotypes that have been flying the radar. The ancestors of the Kikuyu can be said with some certainty to have come from the north, from the region of the Nyambene Hills to the northeast of Mount Kenya (Kirinyaga), which was the original if not exclusive homeland of all of central Kenya's Bantu-speaking peoples, viz. the Meru, Embu, Chuka, Kamba and possibly Mbeere. The people are believed to have arrived in the hills as early as the 1200s. From where they came, though, is a matter subject to a lot of controversy (ie. speculation based on few facts): one theory argues that they came from the mythical 'Shungwaya', presumably in Somalia, from which the nine tribes of the coastal Mijikenda also say they came. The other main theory posits that they came from the west, having split from the proto-Bantu of central Africa. Whatever their early origins, it is generally accepted that starting from around the 1500s, the ancestors of the Kikuyu, Meru (including the Igembe and Tigania), Kamba, Embu and Chuka, began moving south into the richer foothills of Mount Kenya. By the early 1600s, they were concentrated at Ithanga, 80km southeast of the mountain's peaks at the confluence of the Thika and Sagana rivers. As Ithanga's population increased, oral traditions of all the tribes agree that the people began to fan out in different directions, eventually becoming the separate and independent tribes that exist today. The theory that the Chuka, Embu, Mbeere, Gicugu and Ndia 'broke away' from the main Kikuyu group before arriving at Ithanga is plausible, but is contradicted by the oral traditions of various tribes, many of which include Ithanga in their histories. The Kikuyu themselves moved west to a place near present-day Murang'a, from where the Kikuyu creation myth picks up the story. The actual point at which the Kikuyu became a separate and independent people with their own and unique sense of identity is fairly clearly stated in oral tradition, which says that the founder of the Kikuyu was a man named Gikuyu. One day, Ngai (god) gave him a wife called Mumbi, and commanded them to build a homestead near Murang'a, to the southwest of Kirinyaga (Mount Kenya). Some versions of the myth say that Ngai first took Gikuyu to the top of Kirinyaga to behold the land that he was giving them. The place that Gikuyu and Mumbi settled in was full of wild fig trees (sacred among many Kenyan peoples, not just Bantu), and was called Mukurue wa Gathanga, which loosely translated means 'Tree of the Building Site', and even more loosely 'the Kikuyu Garden of Eden'. The location is still sacred, even though the fig tree - which was believed to have been as old as the Kikuyu themselves - disappeared a few decades ago. Mumbi bore nine daughters, who married and had families, and which eventually became clans. Ngai gave them the highly fertile lands to the southwest of the mountain to live in. These clans - the true ancestors of the Kikuyu - are actually called the 'full nine' or 'nine fully' (kenda muiyuru), for there also was a tenth daughter, who descended from an unmarried mother in one of the other nine clans (which suggests the later amalgamation of at least one other people into the Kikuyu). Until recently, it was a common taboo for anyone to give the exact number of their children; violating the taboo - any taboo - would portend a bad omen. Virtually every Kikuyu woman is named after one of the 'nine' daughters of Mumbi, and the creation myth - like many others among Bantu-speaking people - suggests that ancient Kikuyu society was originally matriarchal. According to some, the men grew tired of their treatment by the women and rebelled. This myth was used in a Mau Mau resistance song during the fight for independence. See the lyrics of Mukurwe wa Nyagathanga in the Music and Dance section. As can be guessed from the above, the early history of the Kikuyu is certainly not simple, and things become further complicated for historians and anthropologists with the inevitable intermarriage and interaction that occurred (and still occurs) between the various tribes and groups that had parted ways at Ithanga, and which continued as the Kikuyu spread out from Mukurue wa Gathanga to cover their present terrain. The Kikuyu have always been happy to adapt and to adopt, and, in terms of territorial expansion, were by far the most successful of the groups that had originally migrated south from the Nyambene Hills, relying on a combination of land purchases, blood-brotherhood (partnerships), intermarriage with other people, and their adoption and absorption. Only occasionally did warfare figure in this expansion, such as in the early 1800s when a combined Kikuyu, Maasai and Athi force defeated (annihilated?) the hunter-gathering Gumba (or Agumba), a people which one Kikuyu legend refers to as pygmies. The original inhabitants of Kikuyu-land, it is said, were the Thagicu, who practised iron-working, herded cattle and sheep and goats, and hunted. The similarity in name between Thagicu and Gikuyu would suggest that they were in fact the Kikuyu's earliest known ancestors, if not their primary lineage. They may indeed have been the 'tenth' of the 'fully nine' clans, though I admit that that is merely speculation. Sources differ on the ethnic identity of the Thagicu - some say they were Bantu-speaking, others that they came from Cushitic peoples. As the land was fertile and ideally suited to agriculture, the population increased rapidly, causing further waves of migration which lasted until the eighteenth century: west into the Aberdares (Nyandarua Mountains), south to the present site of Nairobi, and north to the Nyeri plains and the Laikipia Plateau, where the Kikuyu came into contact with the cattle-herding Maasai (who were evicted from the area by the British early in the twentieth century). Unusually in contacts with the Maasai, the Kikuyu were neither conquered nor assimilated by them, but instead engaged in trade (as well as sporadic cattle raiding), which led to a deep and long-lasting social interaction which especially affected the Kikuyu. During the Maasai civil wars at the end of the nineteenth century, hundreds of Maasai refugees were taken in and adopted by the Kikuyu, particularly those in Kiambu. In consequence, Nilotic social traits such as circumcision clitoridectomy and the age-set system, were adopted; the taboo against eating fish was also accepted; and people intermarried, so much so that more than half of the Kikuyu of some districts are believed to have Maasai blood in their veins (including Jomo Kenyatta himself, whose paternal grandmother was Maasai). From other peoples came loanwords for ceremonial dances, plants and animals, and the concept of irrigation as an agricultural technique. Although the Kikuyu were a formidable fighting force, the agricultural nature of their lives meant that violence was generally only used for defence, for they lacked the mobility of pastoralists such as the Maasai and Samburu, who lived to the north and west. Geographically, the Kikuyu were relatively well protected, with the Ngong Hills so the south, the Nyandarua Mountains to the west, and Mount Kenya to the northeast. To the east, also, were the related Meru, Embu and Kamba people, with whom relations were generally friendly, replying as they did on their trade with the Kikuyu. Defence was thus a primary concern only in the west, where the Kikuyu were wary of settling or venturing out onto open plains for fear of the Maasai, who were interested in controlling the widest possible areas for their herds. Greater defence was necessary only close to the Maasai border, with the result that villages there were in effect forts and were built for maximum protection. Generally, only those family groups (mbari) with "many warrior sons" or which had attracted a clientele of fighting followers could muster the defence necessary to settle these new areas. These villages were also well concealed: Europeans found they could be walking only metres from a settlement without knowing of its existence. Economically, the Kikuyu were blessed with some of the most fertile land in Kenya, their 'work ethic', and their willingness to adapt and adopt to new situations. This made them ideally suited as traders, so much so that the majority of Kenyan businesses today are run by Kikuyu. Having settled in an environment ideal for agricultural pursuits, the Kikuyu exploited it to the full, producing food far in excess of what they needed to feed themselves. This was in stark contrast to the Embu, Mbeere, Chuka, Kamba and the hunter-gathering Okiek (Ndorobo), whose lands were far less fertile, and were prone to drought and famine. At those times, when trade became a necessity for their survival, it was to the Kikuyu that they turned. In return for supplying food, the Kikuyu received all manner of goods, ranging from skins, medicine and ironwork from the Mbeere, livestock and tobacco from the Embu, and salt and manufactured trade goods brought up from the coast by the Kamba, with whom the Kikuyu had their most important trading relationship. Trade also occurred with the Maasai, who may well have introduced elements of cattle culture to the Kikuyu. Even as the men were engaged in raiding each other's livestock, Kikuyu women continued to trade with Maasai women. Local markets proliferated in populated areas, as they do today. Women transported barter goods in caravans and were generally safe under the protection of middlemen (hinga), who represented the group with whom they intended to trade. By the nineteenth century, the Kikuyu had become so adept at trade that they became involved in supplying the Swahili ivory and slave trade with food, eventually - as the Kamba trade declined - usurping the role of the Kamba as intermediaries between the coast and the hinterland. That was such a fascinating read. I remember most of it from my history lessons in primary (I was a bonafide history geek) but its so interesting to read it again so many years later. Sometimes I toy with the idea of becoming a historian. I think I'd quite enjoy it. Now I have a yearning to read some history texts. Hello. I've been around people from your tribe, kikuyu. I had a great time at one of their house warming parties. In short, I think that it is very important to preserve and to know as much as possible about your culture. My wife is from South Africa and even though I am African American, I feel that it is very important for our child to know the Sesotho language and culture. Great post! I guess that is why I embrace my African past. My grandmother's ancestors were Nigerian (Ibo). I don't know my mother's origin; I feel lucky because most Blacks from America do not as you well know. I embrace my Black Southern culture because it is the closest to who we were before we stripped of our identity. However, it is difficult for me as an American native to embrace American culture because of it's commercialist and capitalist ideologies. Stephen: Well your southern heritage coupled with the Nigerian and now thru marriage now SA (Zulu?) you have an identity. I feel you on the material nature of American culture and speaking of which, the christmas season just portray that.Can't Christmas just be a simple day spent with loved ones and thank God for the day? Amazing! I would like to know who married the nine daughters of Gikuyu and Mumbi. I would guess Masai. I mean, in the beginning there was only Gikuyu, mumbi and their nine(ten) daughters. What do you say Ciru? Makumi: Yeah that is a food for thought:Who married Kikuyu daughters? Well Masaai is a possibility since the tribe was trading partner..No wonder I think I have some masaai traits:-)))) Jokes aside, I need to research on that. By the way makumi, you need to write more on your empty:-) blog...what do you say? i think you're doing a great job...i need to learn more about the kikuyu culture n traditions. Especially about the whole marriage...i'd like a traditional but yet modern kyuk wedding! Too Friendly for your Own Demise! Finally -Intelligent Analysis on RAILA & CO. Prayer for Peace in Kenya!!!! !